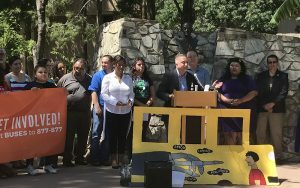 PHOENIX – A local grassroots environmental group gathered outside the Arizona state Capitol on Thursday to draw attention to diesel pollution. They want state officials to use the nearly $57 million the state will receive from the national Volkswagen settlement to replace diesel school buses with electric buses. 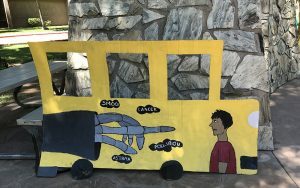 Chispa, a Latino advocacy group for the League of Conservation Voters, launched the Clean Buses for Healthy Niños Campaign in April. Leaders said they have pushed Gov. Doug Ducey for a commitment. The settlement came out of a United States government lawsuit that charged Volkswagen with rigging its “clean diesel” vehicles to cheat on emissions tests. The settlement requires the company to pay about $15 billion to compensate customers and mitigate pollution, according to the state. Arizona will receive its funds over a 10-year period, and the state must use the money to reduce nitrogen oxide emissions. The state must come up with a plan and submit it to a trustee, according to the state. “This $57 million fund is coming to the state as a consequence of cheating an emission and trying to turn the corner, so let’s use that money correctly,” Congressman Raul Grijalva, D-Ariz., told the crowd at the Capitol on Thursday. Chispa officials suggested there’s an easy solution. The exhaust from diesel buses can emit more than 40 toxic contaminants, endangering children, bus drivers and school staff, according to the Respiratory Health Association. Community members at Thursday’s rally said the buses also harm communities since they often idle in one spot. “Kids in the community can’t go out and play when there are pollution warnings,” said Veronica Monge, a community organizer for Chispa.